If you think the Securities and Exchange Commission has been cranking out more enforcement actions since President Obama took office, you’re right, says a July 18 Harvard Law School Forum post by lawyers at Gibson, Dunn & Crutcher. 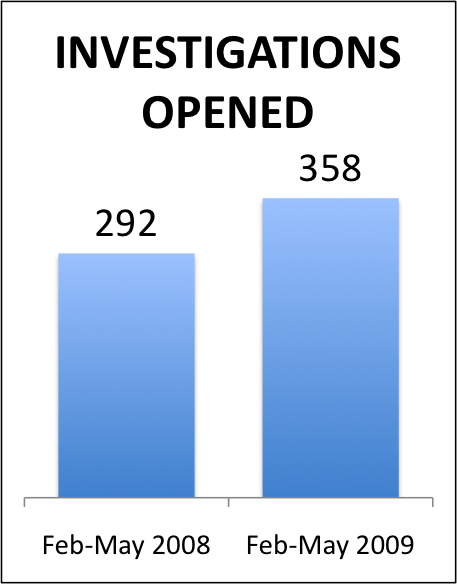 The numbers show a big increase in enforcement actions across various categories: new investigations opened (+23% in early 2009 vs. 2008), formal orders of investigation (+154%), temporary restraining orders (+183%) and injunctive actions (+46%). No huge surprise in the upturn: Administration officials have been rattling sabers and talking tough, and members of Congress have been calling for the heads of CEOs as some kind of retribution for the economic downturn. At the National Investor Relations Institute annual conference, as noted June 8 in this blog, NIRI President & CEO Jeff Morgan warned more SEC enforcement cases are coming. More telling than the statistics, in the last few months, the SEC has filed a number of high profile cases that demonstrate a more aggressive enforcement approach and that are consistent with the themes that [SEC’s new enforcement chief Robert] Khuzami has articulated. Not surprisingly, the SEC has focused its attention on cases related to the financial crisis. In addition, in an effort to bring cases more quickly, the SEC has also more frequently filed these cases in the absence of settlements and in the absence of parallel criminal cases. Moreover, presumably towards its goal of sending an “outsized message of deterrence,” the SEC has charged senior level individual executives. Since I’m no lawyer, I won’t interpret SEC developments. You can read details in the Gibson Dunn post. As part of an investor relations team, of course, you should be discussing trends like these regularly with your company’s lawyers. This entry was posted on July 20, 2009 at 1:00 am and is filed under Regulatory & SEC issues. You can follow any responses to this entry through the RSS 2.0 feed. You can leave a response, or trackback from your own site.